Do you know a girl who likes to sing? Does she like making new friends or learning about music? 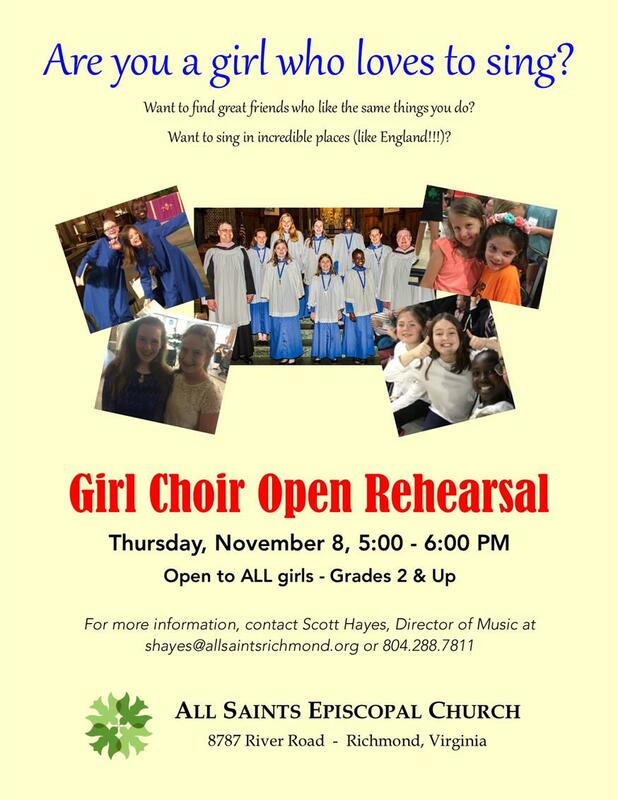 Girls (grade 2 & up) and their parents are invited to attend an open house at All Saints Church on Thursday, November 8. Girls are join the choir in rehearsal from 5:00 - 5:30 PM, and then get to know each other over some pizza from 5:30 - 6:00 PM. Parents are invited to watch rehearsal at 5:00 PM, and join current choir parents and others for wine & cheese at 5:30 PM. No prior music experience or church affiliation required! All that is needed is a willingness to try new things, a desire to learn, and meet new people! Please RSVP on the form below! For more information about All Saints Girls' Choir, click here.